The Hinderer Knives XM-18 3.5" is a precision-crafted hard-use tactical folder you can carry every day. It features a Harpoon Spanto blade and integral flipper for easy opening when it matters most. As the medium sized model in the Hinderer family, the XM-18 3.5 was designed to fit most hands comfortably and has a reasonable blade size to handle most any task. Easy one-hand operation and a reliable lock system are the foundation of the XM series. 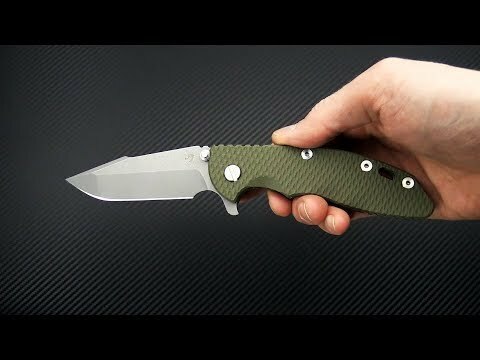 This version comes with a Working Finish S35VN blade, matching frame and Green G10 scale. The Gen 6 features a hardened steel lock face insert and Tri-Way Pivot detailed below. Brand new directly from the Hinderer Ranch. Blade: The three and a half inch blade opens fast and smooth via the integral flipper or dual thumb studs/blade stops. The CPM S35VN blade delivers a good balance of durability, edge retention and corrosion resistance and sports a Working Finish (blasted & tumbled) that hides wear and is non-reflective. Rick's own Tri-Way pivot system creates silky smooth operation with your choice of bearings (installed), or nylon or bronze washers. The detent is dialed in for decisive flipper deployment. Handle: Full titanium frame lock and liner have a matching Working Finish that is rugged while still having a handsome appeal. Satin Hardware and standoffs create one solid package while 3D texturing on the G10 scale coupled with jimping all around create a solid grip. There is also a bit of a choil to choke up on the blade for more detailed cutting tasks as well. This Hinderer XM-18 includes the famous Hinderer Lockbar Stabilizer and two-position titanium clip and insert for tip up or down right hand carry. The XM-18 is completely customizable with accessory clips, scales and hardware. 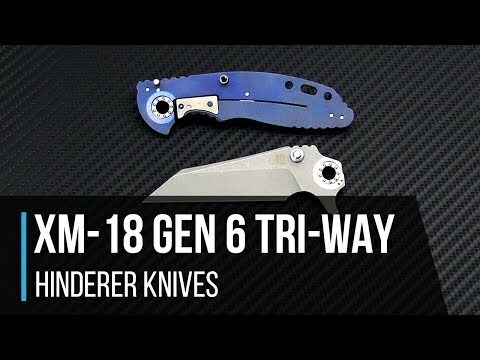 Tri-Way Pivot: The newest innovation from Rick Hinderer, the Tri-Way pivot features milled pockets in the blade and frame allowing for the use of ball bearing pivot washers (installed) or, utilizing steel spacers to fill those pockets, you can use either of the included sets of nylon or bronze washers to customize the action and operation of your knife.